(Back) Nancy's Alterations & Yarn Shop, and Jewelry by Tim Psaledakis and Friends. 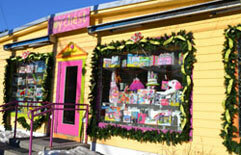 The Museum Shop at the Weather Discovery Center is on the northern side of Main Street near the Toy Chest and the library. At the southern end of Main St., there is an independent book store called White Birch Books which features signed copies of books by local writers like Lisa Gardner, author of Right Behind You (suspense thriller) and Abi Maxwell, creator of Lake People. White Birch holds author luncheons and book groups. There is a children's section as well as greeting cards. They also have an online store selling books, movies, music and e-books. Next to Peaches, a popular breakfast spot, you will find Assets Jean Co. featuring brand name jeans and stylish sweaters and outerwear. At this end of Main St, you can also find the Bavarian Chocolate Haus which makes fresh chocolate delectables everyday. They have fudge, fudge sauce, maple flavored chocolates, sugar free chocolate plus dark, white and milk chocolate items. Another shop on Main is Soyfire Candle. They have neat burning soy candles, as well as palm wax candles which burn brighter and cleaner than traditional paraffin candles. A favorite of village shoppers is Zeb's General Store. 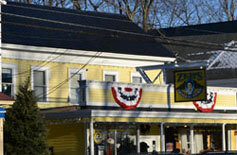 Zeb's is great for locally made prepared foods, like maple syrup, hot sauces and jams. 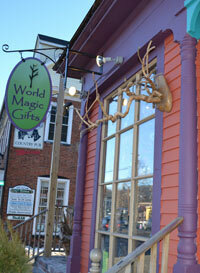 They also have gifts, candy, soaps, toys, games, and an old fashioned beverage counter with their own brand of sodas. It is great for browsing, souvenir buying, snacking and picking up unique gifts. 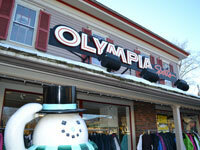 Olympia Sports, Joe Jones Sun & Ski Sports and International Mountain Equipment can supply you with your outdoor clothing, gear, accessories and rentals plus any of those things you forgot to bring like your ski gloves, hiking socks, bathing suits, ski goggles and helmets. After shopping, duck into shops and restaurants to warm up. Snacks and desserts can be found at the Met Cafe and Gelato House, Frontside Grind Coffee & Espresso, Spoons Ice Cream Parlor, and Old Village Bakery. (White Mountain Cupcakery, winner of Food Network's "Cupcake Wars." is located at Settlers Green.) Lunch and dinner are available at Flatbread Co., Horsefeathers, Taste of Thai and Vito Marcello's Italian Bistro. Flatbread Co. inside the Eastern Slope Inn bakes delicious pizzas in two large wood-fired ovens you can see while waiting in this cozy restaurant. They have a fireplace in the waiting area and a comfy couch. 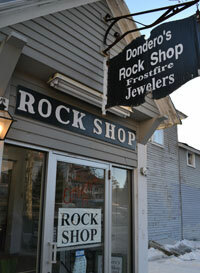 The lobby of the Eastern Slope has a few shops also, such as It's My Girlfriend's consignments. 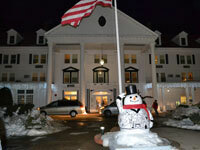 You'll notice snowmen welcome you at Eastern Slope Inn and Olympia Sports. The village lights begin to sparkle at dusk and the town takes on a festive feel even though the weather at this time of year is likely to be quite chilly. One way to stay warm is to join in on the winter sports. There is a cross country skiing trail in town. The MWV Ski Touring and Snowshoe Foundation maintains trails that connect North Conway Village with Intervale and Kearsage. Daily membership passes, lessons and rentals are available at the Touring Center next to Ragged Mountain Equipment on Rts.16/302 in Intervale. You can ski from inn to inn through the villages. See the MWV Ski Touring website for more details about trail maps, difficulty levels, special events and a list of inns and restaurants on the trails. There is an ice skating rink at Schouler Park (check schedule for days and times) right downtown near the train station. Cranmore Mtn. Resort with downhill skiing and snowboarding trails is visible from North Conway Village. It is .8 miles from Main St., a long walk or a very short drive from the shops. The resort is family friendly with many activities for kids, such as their Mountain Coaster, Soaring Eagle Zipline, Giant Swing and Tubing Park. They have skiing and snowboarding lessons and rentals. 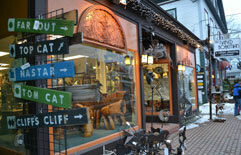 They offer ski and stay packages in coordination with nearby inns, bed & breakfast's and resorts. 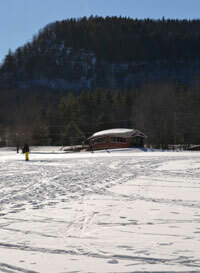 The winter scenery in North Conway is spectacular with mountain views, quiet forests and winding rivers. Several other popular downhill skiing destinations besides Cranmore are within driving distance of North Conway, including Wildcat, Attitash, Bretton Woods, King Pine and Black Mountain. Whether you enjoy alpine or nordic skiing, snowshoeing, or ice skating, you will be able to do all of these and more winter sports in the stunning Mt. Washington Valley. In the winter, the snow doesn't stop a hardy few who venture to the summit with Mount Washington Observatory's educational trips aboard a snow tractor (subject to weather conditions, age, health restrictions and equipment requirements). Overnight trips are also available. You can learn about the observatory and experience the polar weather conditions of the summit area. Or just wait until Spring and enjoy a scenic ride aboard the Mt. Washington Cog Railway or drive your own car to the summit for that prized "This car climbed Mt. Washington" bumper sticker. Also in the spring, the Mt. Washington Auto Road Stage Van will give you a two hour guided tour to the summit and back. And without leaving town, you can visit the Weather Discovery Center on Main St. where you can receive updates from the weather station at the top of Mt. Washington and learn about the extreme temperatures and wind gusts that occur there. The Museum Shop at the Weather Discovery Center has weather instruments, toys, books and souvenirs for weather enthusiasts. Looking forward to Spring, the Conway Scenic Railroad will be starting trips on weekends in April. The railroad is known for scenic rides, the dinner train and special summer visits from Thomas the Tank Engine and the Polar Express ride (Christmas season). StoryLand is beginning weekend hours starting Memorial Day Weekend. This favorite attraction is a family friendly amusement park with rides and shows based on storybook themes. Book characters make appearances on scheduled dates throughout the season. With driving times of 2 1/2 to 3 hours from the Boston area, 3 hours from Brattleboro, Vermont and 1 1/2 hours from Portland, Maine, the village of North Conway is a great shopper's and outdoors lover's destination. It can be family friendly (StoryLand from May through October, Thomas the Tank Engine's summertime visits and Red Jacket Resorts' Kahuna Laguna Indoor Water Park), great for shopping (village shops and nearby outlets), or a romantic mountain getaway (lots of lovely inns, B&B's and restaurants). This town changes with the seasons. Whether it is Winter sports, Fall foliage, Spring hiking or Summer fun, North Conway is a scenic shopping town you will want to return to all year round and for years to come. 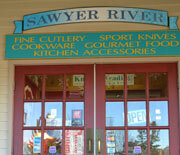 For more information and links about shops, restaurants, accommodations and attractions in North Conway, click here.